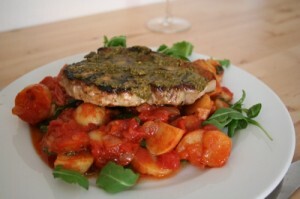 This recipe shows how to cook a pork loin combining elements of Italian food and grilling. It is called Italian Grilled Pork Loin. Combine rub ingredients, rub onto roast and let it marinate in a refrigerator for 8 hours. Heat oil and butter in a skillet until the butter stops foaming. Sear the roast on all sides. Place on a grill at medium heat to finish. It should take about 15-20 minutes. While the roast is on the grill caramelize onions in the skillet, deglaze with wine and add tomato sauce. Cook for 5 minutes. Remove roast from grill, let rest for 10 minutes, and pour the sauce over it, slice and serve. Serves 3-4.